To make Danson Cheese. (75) To three pounds of best damsons add one pound of lump Sugar, boil it quick till it comes to a proper consistency and when done crack the Stones and put the kernels into it. A Junket. 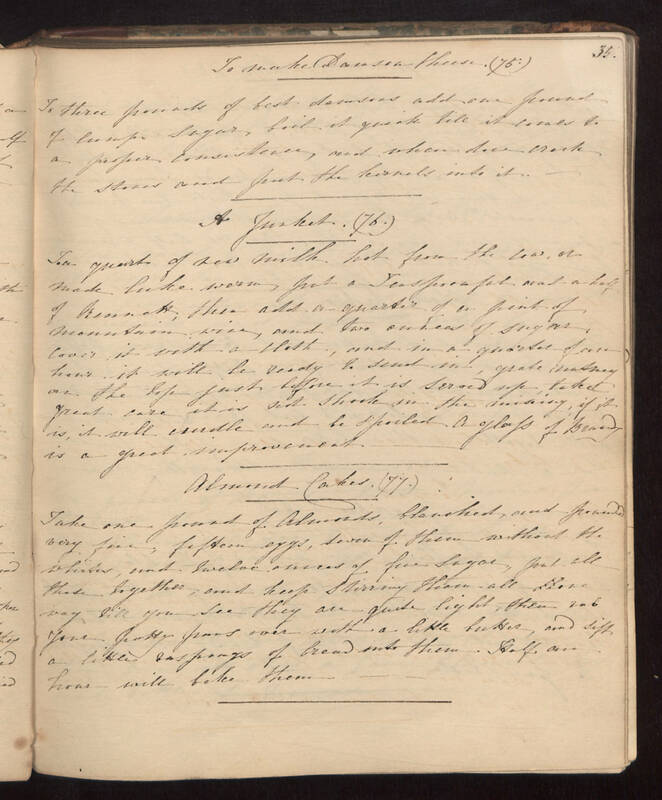 (76) Two quarts of new milk hot from the cow, or made luke warm put a Teaspoonful and a half of Rennet; then add a quarter of a pint of mountain wine, and two ounces of Sugar, cover it with a cloth, and in a quarter of an hour it will be ready to Send in, grate nutmeg over the top just before it is Served up, take great care it is not Shook in the mixing , if it is, it will curdle and be spoiled. A glass of Brandy is a great improvement. Almond Cakes. (77) Take one pound of Almonds, blanched, and pounded very fine, fifteen eggs, Seven of them without the whites, and twelve ounces of fine Sugar, put all those together and keep Stirring them all one way, till you See they are quite light, then rub your pretty pans over with a little butter, and sift a little raspings of bread into them. Half an hour will bake them.